Adenoma sebaceum is a condition in which there are many tumors appear on skin due to disorder in genetics that is tuberous sclerosis. Adenoma sebaceum don’t go with its name as the tumor appeared is not adenoma i.e. a benign tumor and also it does not involve the sebaceous glands i.e. glands which produces sweat. The disease appear as lesions around the nose and cheek area. These lesions are small in size. The patient may not feel pain in these lesions. The disease adenoma sebaceum is also named as angiokeratoma in tuberous sclerosis, fibrous skin tumor of tuberous sclerosis and pringle tumor. 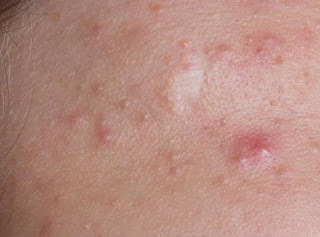 Adenoma sebaceum resembles a condition called acne vulgaris. It is not reported as harmful disease also there is not any health issue related to it. Adenoma sclerosis is considered as a visual sign of genetic disorder named tuberous sclerosis which is actually the disease. Adenoma sclerosis do not cause any problem to the patient except it may get worse with the use of cosmetics on face. These small lesions are basically the tiny erythematous papules significantly appearing on nose and cheeks around it. Some people thought as it is acne that is not getting cure with acne treatment. Small, tiny, minute in size lesions appear on face significantly on nose and cheeks around it and also on nasolabial folds. The lesions on face turns into small fresh looking, red in color, tiny papules that mostly resembles bumps. The papules formed may also be brown in color. There may be sometimes bleeding occurs from these lesions if any injury happen to them. 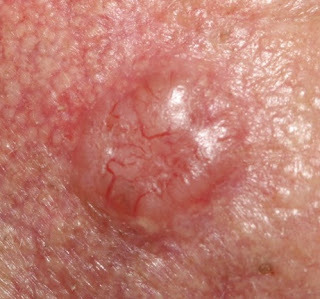 The size of these lesions may be less than 1 cm. The pain do not exist with these lesions. The most common cause reported behind adenoma sebaceum is the presence of disease named tuberous sclerosis. Tuberous sclerosis is basically a genetic disorder inherited from parents. This condition is the autosomal dominant condition which involves the genes named TSC1 and TSC2. Children are more susceptible because as it is caused by inherited disease, so symptoms will start appearing in childhood mostly at the age of 2. But the condition may become worse with the age increasing. The person having background racial and ethnic are also susceptible, so these may be considered as a cause. The treatment associated with this condition is the surgical removal of these papules because this condition is associated with genetic disorder that cannot be cure. So many topical products are used to eliminate these papules and otherwise laser is another method for removal of these red papules. The topical products used are TOR inhibitors. Shave biopsy is another method for removal in treatment. There are also some other techniques associated with treatment and these techniques are dermabrasion and laser excision. Rarely, the genetic disorder may also be treated with genetic engineering techniques. The follow up plans for patient are important.